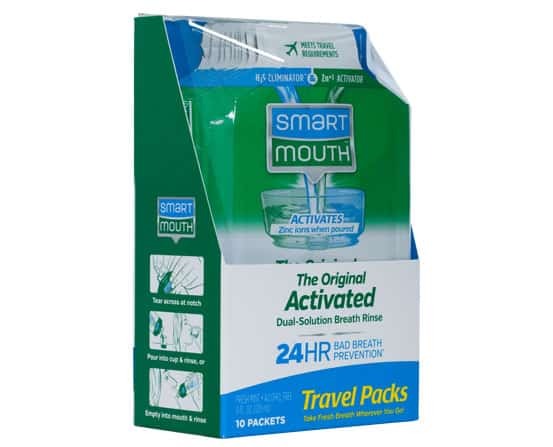 Convenient SmartMouth Original Activated Breath Rinse Single Packs make it easy to take SmartMouth on the road. 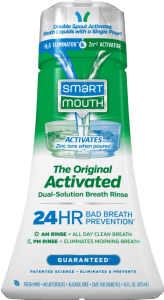 These flexible, TSA-approved packets work just like the dual-pour bottle to keep the two liquids separate until use. Perfect for your purse, luggage, briefcase, or pocket. 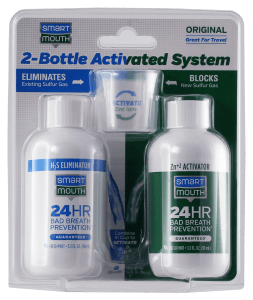 SmartMouth 2-Bottle Activated Mouthwash System is a mouthwash that’s easy to take on the road. These TSA-compliant bottles keep the Sulfur Eliminator and Zinc Ion Activator separate until you’re ready to rinse.